The 7th Foot was raised in 1685 primarily to act as guards for the army's artillery train. 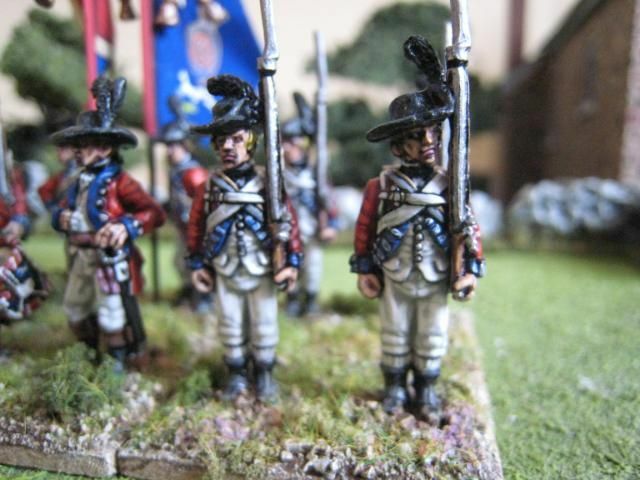 The men were armed with fuzils and the regiment's name followed the older spelling of the word until the 1780s. The regiment arrived in Canada in 1773 and at the start of the war formed part of the Quebec garrison. Most of the regiment together with its colours were captured at Forts St John and Chambly in October 1775 (these colours are at the West Point Museum). The men were exchanged in late 1776 and the regiment reformed for duty in New York. The regiment was sent to Philadelphia in 1777 and the following year fought at Monmouth. It then formed part of the New York garrison until joining Clinton's 1780 expedition against Charleston. The 7th remained in the south and was badly mauled at Cowpens, where the regiment's replacement colours were captured. John Andre, the British officer executed in 1780, had been a lieutenant in the 7th Foot's light company during its Canadian operations. 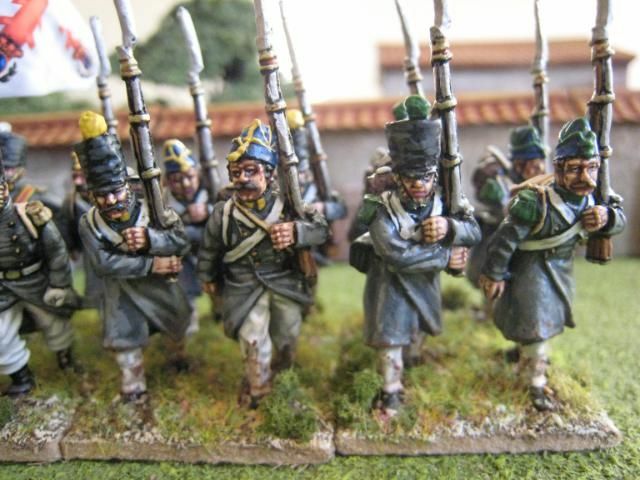 The 7th only appears in two published "British Grenadier!" scenarios, Camden in the first scenario book (18 figures) and early Monmouth in the second (16 figures). The National Army museum has a painting of an officer of the 7th circa 1775 wearing a fusilier bearskin cap (see here), but I'm a believer in the theory that fusilier regiments didn't wear their caps in the field and so I used the Perry campaign dress uniform that matches most of my other 1777/78 regiments. The drummer's coat and lace marks the unit as being a royal regiment. 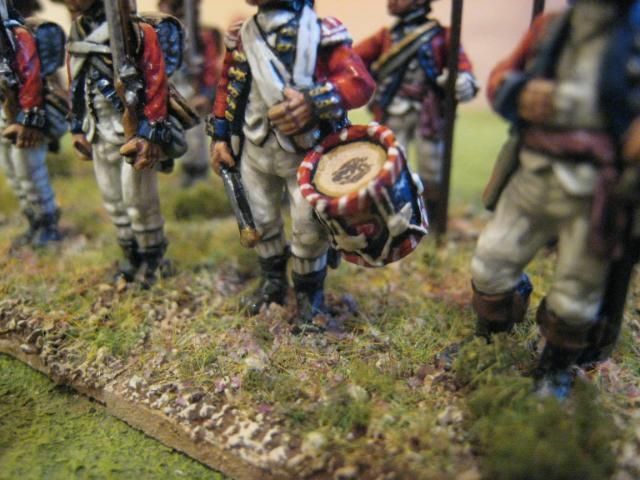 I decided to jazz the drum up a bit by copying the illustration on the Fife and Drum website; I've added a couple of close-ups but the detailing is a bit small for my camera's focusing. The backpack motif requires a bit of explanation. I wanted to do something more elaborate than a simple "7" or "VII" and looked at the colours for inspiration. The regimental badge is clearly the Tudor rose within the royal garter, but this looked too complicated to paint. I considered painting just the rose, but again this would have been tricky to do effectively on such a small area (I recalled my experience with the 9th Foot's Britannia). 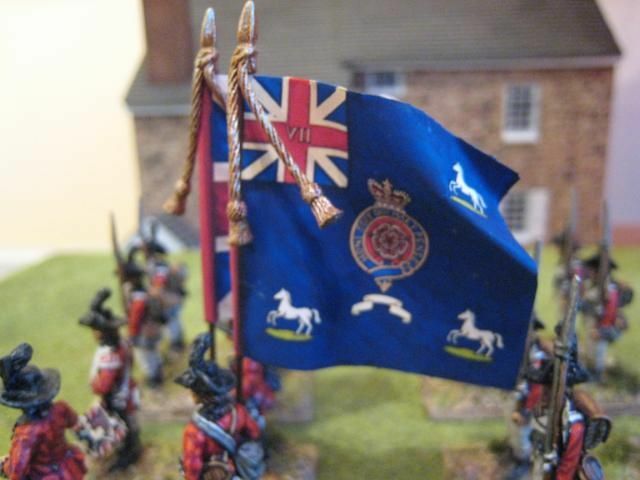 I therefore chose the white horse that appears on the regimental colour, thinking that on a dark blue background the motif could be quite effective. However, what I'd forgotten is that the white horse is the regimental badge of the 8th Foot. I assume that the motif appears on the flags of both regiments because the white horse is a symbol of Hanover and was bestowed by the Kings George on certain regiments as a special honour, beginning, I think, with the 8th Foot. Still, it's not the end of the world and I suppose that what I have here is rank and file which can double-up as both regiments (although the 8th Foot is not something I had considered doing). 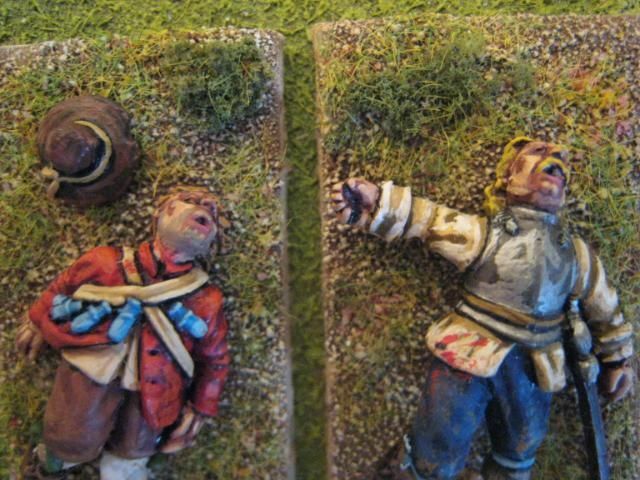 At the bottom is a post of current wip, a Hessian grenadier battalion and my first "post-Hugo" unit (no prizes for guessing which battalion is it, I'm afraid). 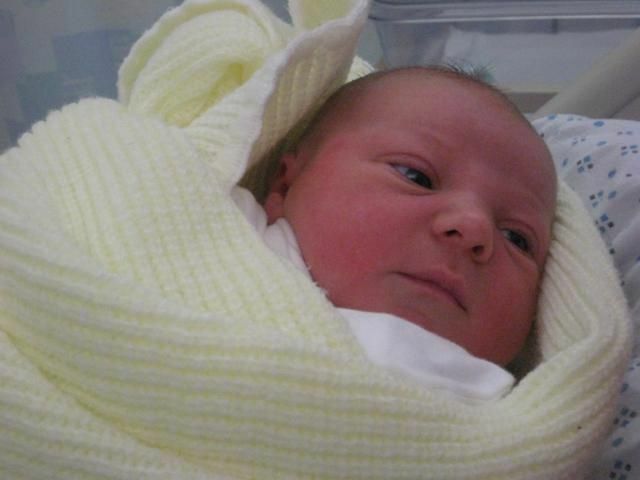 Could I offer a huge "thanks" for all the messages about little Hugo. He is well worth the hard work he currently requires and I hope very much that he will grow up to enjoy this hobby as much as I do - what more could a dad want? 16 figures. Painted December 2009. I've mentioned before how the British Auxiliary Legion in the First Carlist War was essentially a volunteer force, with active officers in the British regular army being discouraged from joining the Legion. The only "regular" troops who served in the war were men of the Royal Navy, Royal Marines, Royal Artillery and Royal Engineers. 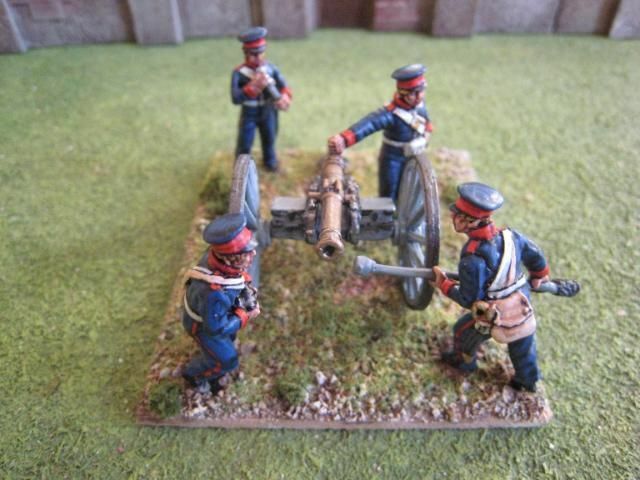 This reflected , in part, the specialisms of these units and the fact that the Legion would not be able to rely on the support of trained artillerists, for example, unless such people were drawn from the ranks of the regular armed forces. Consequently, an exception was made by Lord Hill, the C-in-C of the British Army, to his general veto on serving men joining the Legion as regards the artillery - Captain J.N. Colquhoun and a certain numnber of NCOs and privates were allowed to serve with the Legion with guaranteed reinstatement at the end of the war. The British government also allowed the Royal Navy to take action to prevent ports on the Atlantic coast falling into Carlist hands or, when they had already done so, to assist in their recovery. This policy enabled men from the Royal Marines and Navy to participate in various actions in the war. For example, in Spring 1836, ships of the Royal Navy transported the Legion from Santander to San Sebastian to assist in the Isabelino attack on the Carlist positions there. Lord John Hay, the commander of the British naval squadron, landed a force of marines and Royal Artillery to assist the Legion's assault on the Carlist fortifications at San Sebastian. Don Carlos seems to have noted the distinction between the voluteers of the Legion and the regular British forces - he decreed that the latter would be respected as prisoners of war, whereas the former were liable to summary execution if captured. 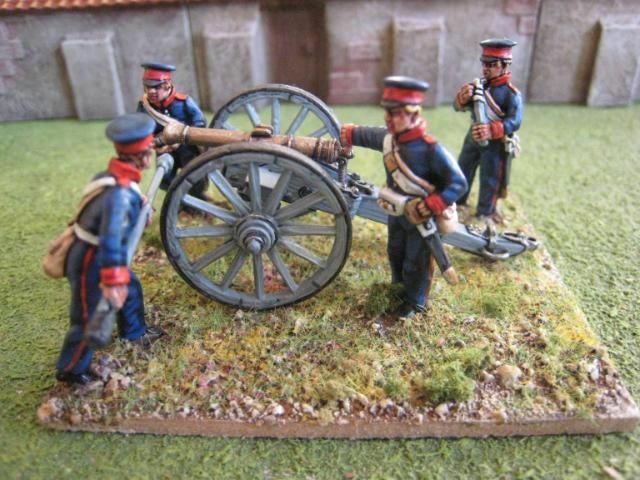 The uniform worn by the Royal Marines artillery and the Royal artillery seems to have been largely the same, so this 6-pounder can do for either. 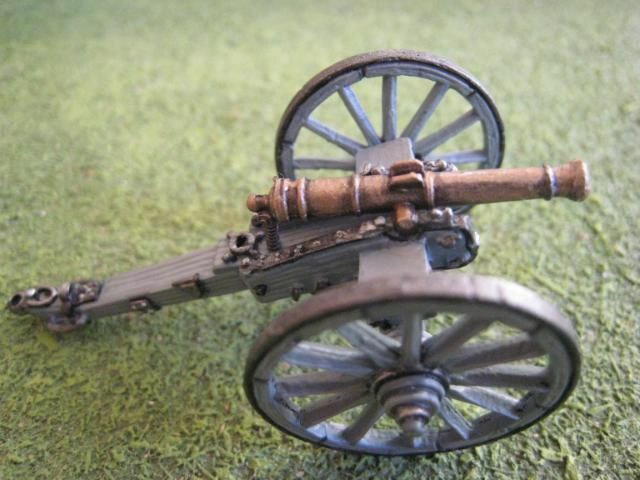 The gun was painted with the Foundry "British Gun Grey 108" palette, which I think is a pretty good attempt at the blue-grey colour of guns during the 19th century. The barrel was painted using the Foundry "Bronze Barrel 103" palette, which is slightly darker than my normal method but quite effective too, I think. 4 figures. Painted November 2009. Looking through Photobucket I realised I hadn't posted pics of these ECW casualty figures. Although a tad gruesome, I thought that I might as well put up the pics since posts are going to thin down rather once the little one finally makes its appearance (8 days overdue now). 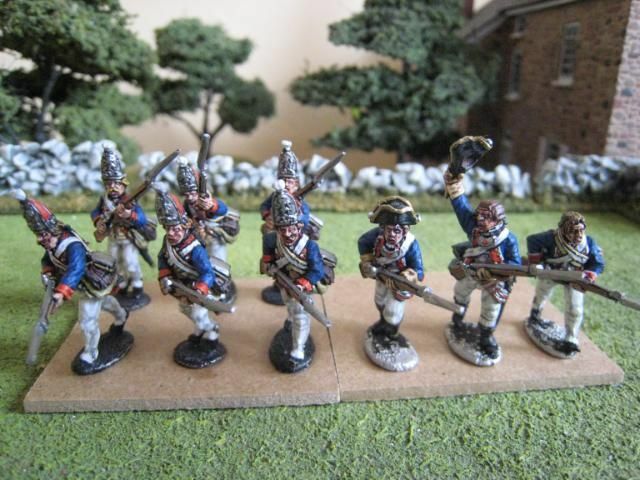 These are Bicorne figures. The pack gives you 4 "falling wounded" figures and 4 prone ones. It seemed appropriate to dirty up these figures, so I added a bit of gore and pastel mud. The NMA infantryman's hat is from Warlord Minatures - they sell extra metal hat packs for their plastic ECW range, which I can see are likely to come in useful for larger command bases and things like this where the figures have lost their headgear. I haven't added weapons and I'm thinking these may well have been picked up by others who had perhaps lost their weapons or had them knocked out of their hands. 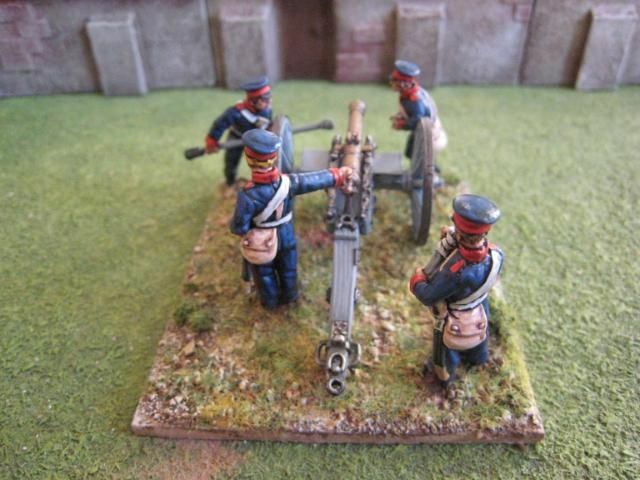 I'll post some more First Carlist War stuff next week. 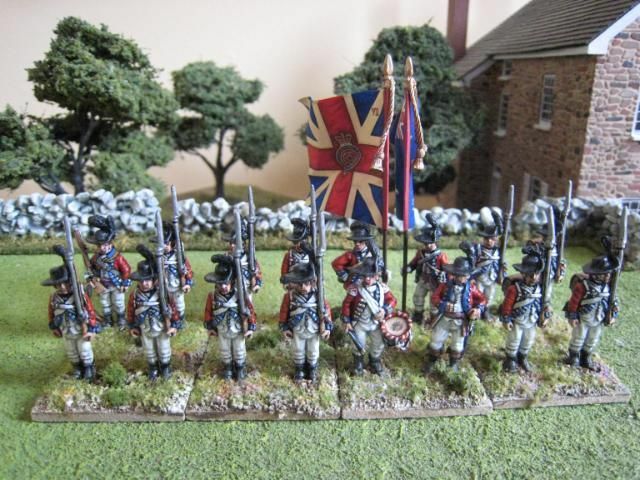 I'm waiting for some more matt varnish to be delivered, which has delayed the basing of my National Militia regiment. 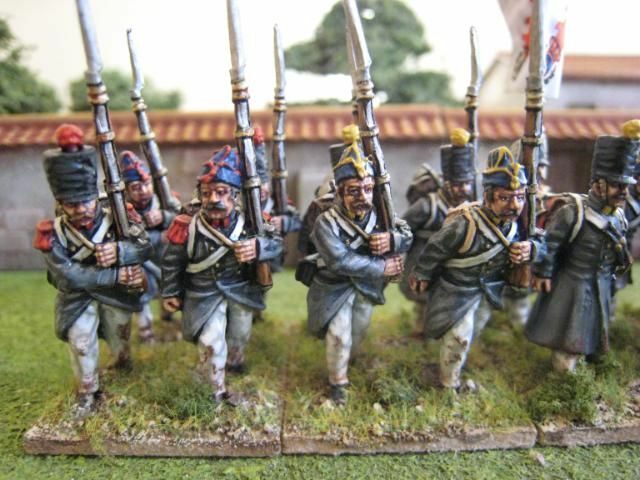 I'm close to finishing the 7th Foot for the AWI (the Royal Fuziliers) and have started a Hessian grenadier battalion. At some point before the end of the year I want to do some "test" Carlist infantry and finish off my first unit of Crusader foot for the First Crusade (current wip pic below). This is the counterpart to the first battalion I did a while ago. I painted the troops in much the same way although I added a couple of battalion-specific touches, such as giving them all white trousers to diffentiate these figures from their sister battalion. The dirt on the trousers was applied using a burnt sienna soft (i.e. non-oil) pastel and then drybrushing with Foundry "Dusky Flesh 6B". 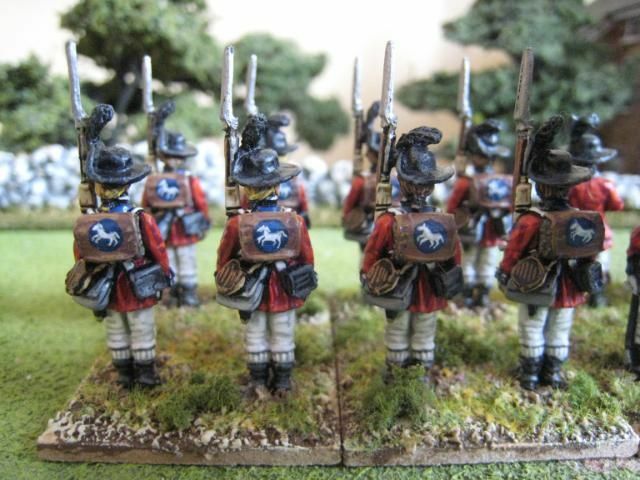 I now have 4 regular line battalions for the Isabelinos, and 3 others. 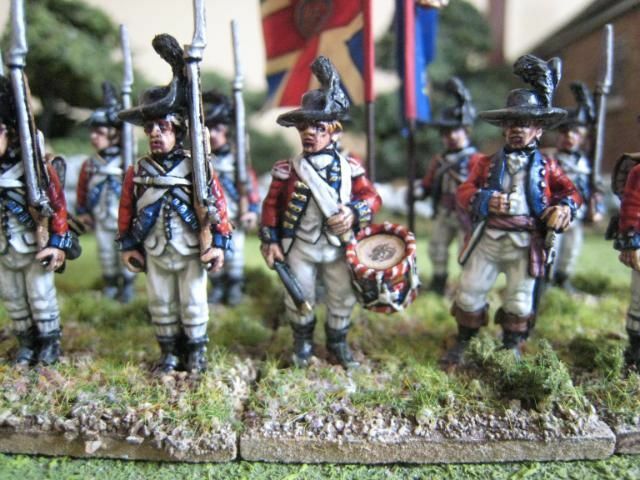 I've just finished some national militia and will then call time on the Isabelino side of things for the moment. That said, I have sufficient leftovers of these greatcoated figures to form another battalion, if I buy another command pack, but have no immediate plans on what to use those for. 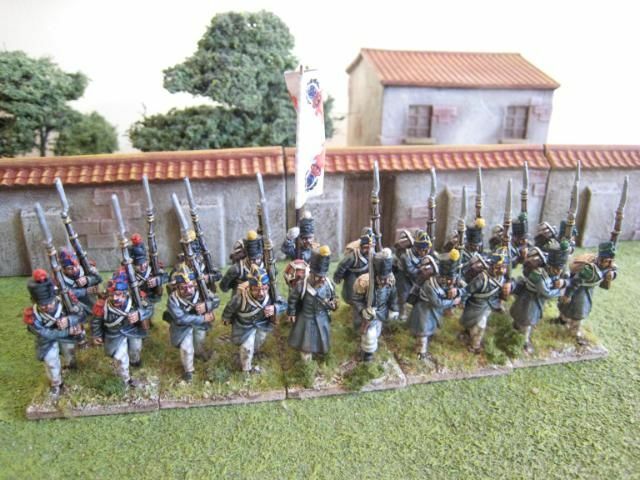 I could do a third battalion for the Borbon Regiment or a single battalion for another line regiment. These are fairly simple figures to paint so I might see if I can whizz them through over Christmas. 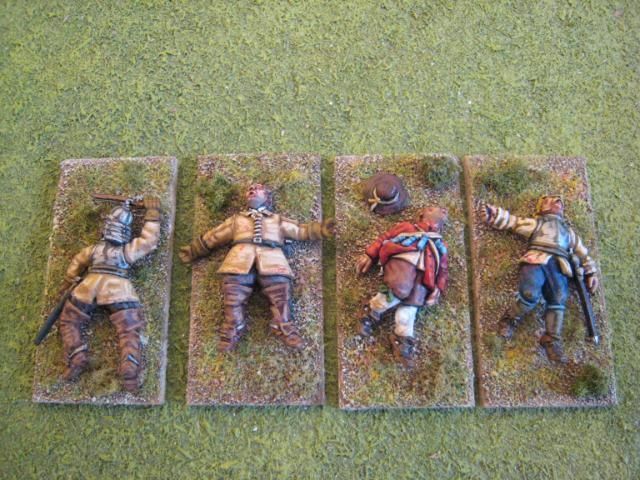 Otherwise it's on to Carlists now (via the AWI), with their greatcoats and hairy faces. 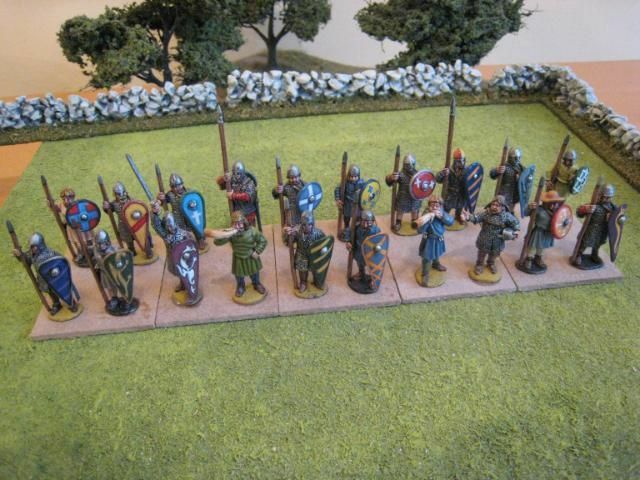 I've said it before and I'll say it again - these figures are among the very finest 25mm sculpts I've painted. The facial detail is a joy to work with and the poses are terrific - these really are mini-humans marching against wind and rain. 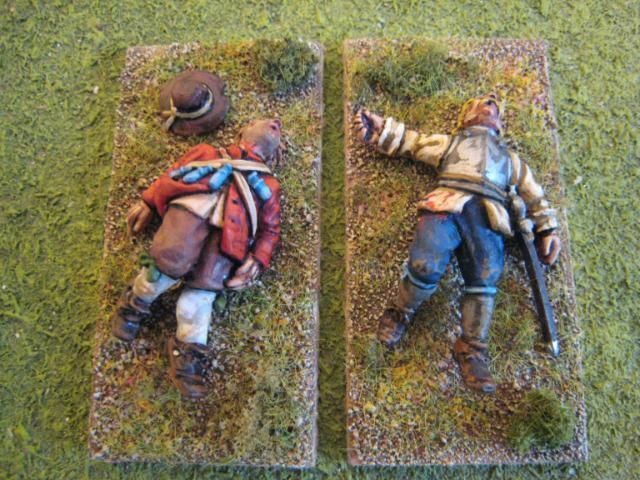 The greatcoats and minimal kit make them quick and easy to paint. 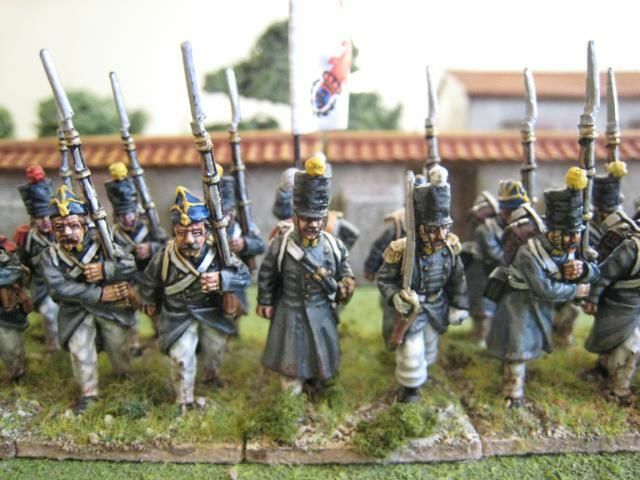 Collectors of Napoleonic French units might consider adding some of these figures, particularly the ones in the Isabelino caps. The buildings in the background are again by "Tablescape" (they are not on their website but are available at shows and I'm sure an email will produce a response telling you how to buy them). 20 figures. Painted November 2009. Flag by Adolfo Ramos. 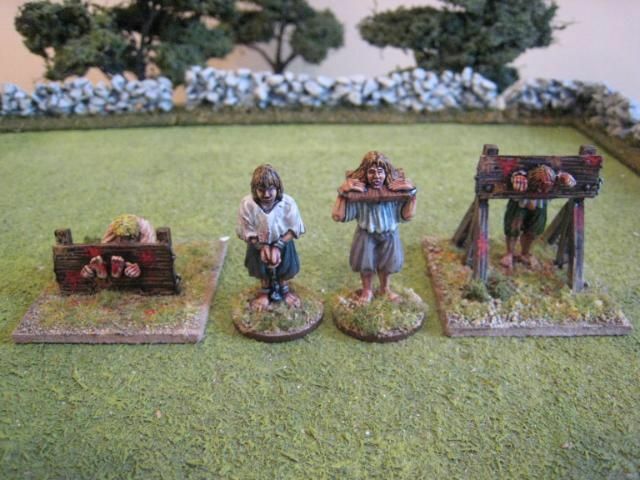 This is a pack called "punishment set" from Redoubt Enterprises. I saw it on their stand at SELWG and had one of those "must buy" moments. I didn't know much about Redoubt's range, although I had heard that it is supposed to be compatible with Renegade and Bicorne. 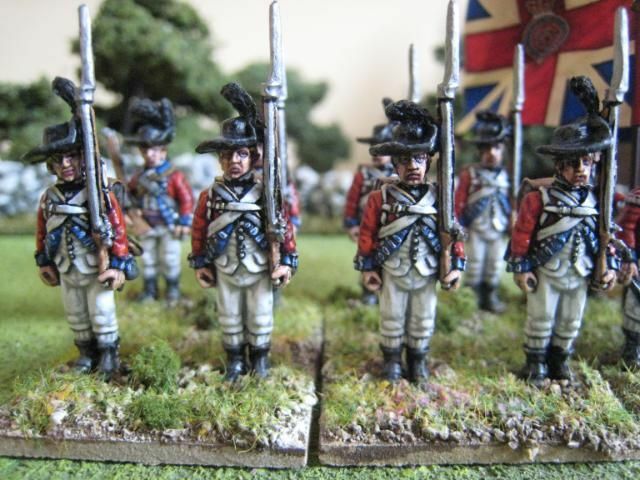 The figures match the former, certainly, but they are fair bit larger than Bicorne, particularly the later Bicorne figures which can be smaller than the earlier ones. These figures are about 32mm high; given that they don't wear hats that's pretty big. 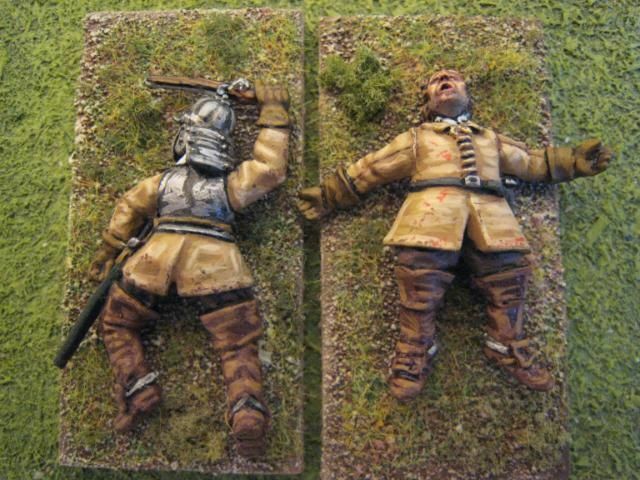 But if you don't mind the size the Redoubt range is worth investigating as it has lots of tasty vignettes - Scottish camp followers, a court martial set, a dragoon demolition party, forlorn hope figures etc. Many of these figures, like the ones here, have a far wider application than just the ECW. These were fun and quick to paint. I canvassed ideas on the WD3 Forum as to what sort of things might have been thrown at people in stocks. 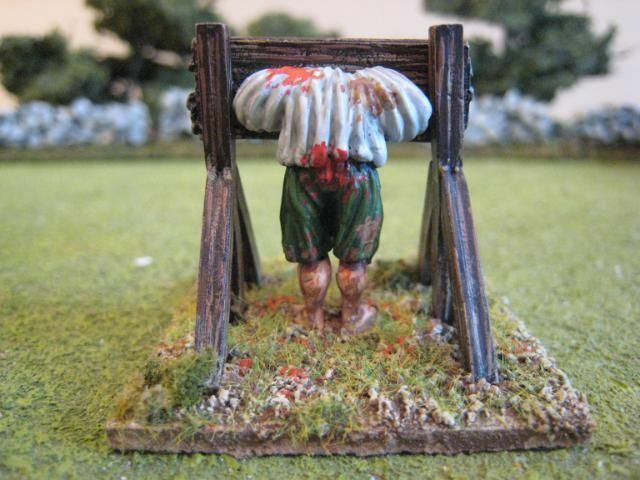 I recently saw on tv a stocks victim being abused in an episode of "Garrow's Law", a series about an Old Bailey defence lawyer in the early 1790s: this chap was being pelted with tomatoes, eggs, radishes and lettuces before being put out of his misery with a well-aimed stone to the forehead. Dung was a popular suggestion on WD3 so I painted the missile splatter in red for tomatoes and a light/medium brown for dung. I tried to place these so that there would be some "direct hits" and some "near misses", together with some completely "wild misses". I used some red flower scatter to suggest bits of tomatoes lying on the ground. It also seemed probable that missiles would be aimed at the rear of the victims, not just the front, so I added some splatter on the most prominent rear-facing parts. I also added lots of mud and dirt to the clothes and feet....I tried to search the internet to see if anyone still makes life-size stocks; unfortunately Google quickly takes you into more general "punishment" sites which are most definitely not work PC friendly. 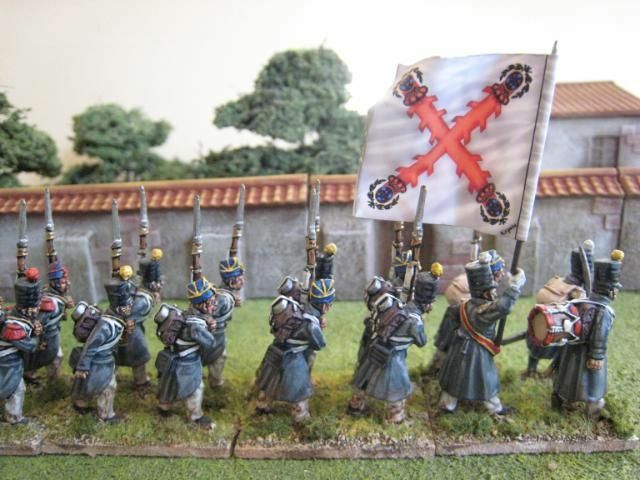 On the painting front I've finished another couple of First Carlist War units and am well stuck into a third. I have also started work on another AWI British line regiment, with a backpack motif that I am having a bit of trouble with. The Perries' recent announcement on TMP about forthcoming additions to their AWI range brought a tear to my eye (and if I was pregnant I'm sure would have brought the immediate onset of labour). 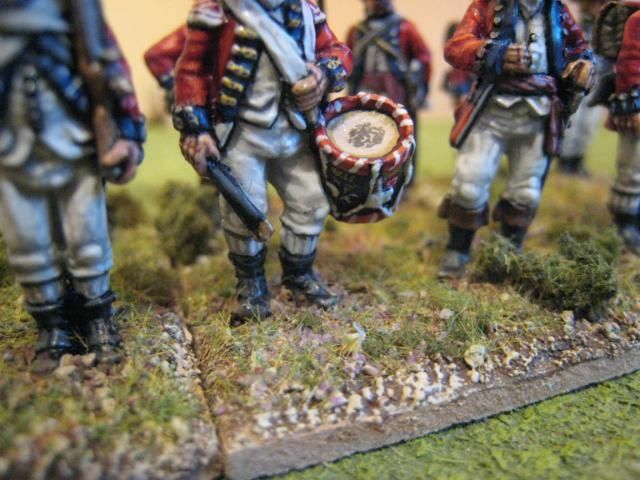 The news sent me scurrying to my "British Grenadier!" scenario books to see what French regiments I "need"; to which the answer is "lots". So I'm looking forward to getting well stuck in to the AWI again next year.